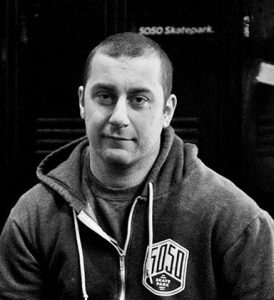 Ed Pollio is the co-founder of 5050 Skatepark, New York City’s only indoor skatepark. The facility located at 354 Front Street in Staten Island, not far from the ferry terminal, opened in July 2012. I am BMXer and a carpenter having started both when I was around 15 years old. I grew up in Staten Island, in the town of Rosebank. When I was a kid I played baseball, then around 15 years old I started riding BMX.BMX was really popular when I was 15. I just followed the bandwagon.At 19, I knew this was something I wanted to do for the rest of my life. What is the history of 5050 Skatepark? Why does NYC need an indoor Park? How does it compare to Brooklyn Banks? In 2006 the NYC Parks Department opened the Ben Soto Skatepark. It was later bulldozed in 2011, for said lack of funds; At the same time they were building a $70 million indoor track across the street from the Skatepark. Anyway, it worked out for the best because we then decided to build our own skatepark. Parents of extreme sports enthusiast on the island were desperate for a good, safe environment for their children to progress and learn, so we decided to build 5050 to meet those needs. Plus New York City winters are cold, and it’s hard to practice outdoors. Just look at this past winter we had. I’ve seen T-shirts that say, ‘I survived winter NYC 2014’. What were some of the challenges of building 5050? In 2011 the NYC Parks Dept bulldozed the Benjamin Soto Memorial Skatepark and we had no place to go. So we rallied together and tried one more time to get the politicians to help. After 4 months we came up with a business plan and realized this is something we could actually do ourselves. And we did! What is unique about 5050? What programs/camps does 5050 offer? We run 5050 Skatepark Summer Sessions July through August. It’s a 9am-5pm program where children work with instructors, have various activities, and are provided free lunch and snacks. We also host many fundraisers for the community. Our Sandy Benefit raised $6,600.00 and the Art show and Kyle Miller Benefit raised $4,000.00. The Crohn’s Disease Benefit raised $400.00 and $1,500 was secured for the SI Arts’ Lark Fund. How has the overall landscape of youth sports changed since you grew up? It shifted I think from a team sport to individual sport. It’s now easier and less expensive to ride or skate. How does the BMX/Skateboard scene in NYC compare to other cities? What about the BMX/skateboard scene in NYC is special? It was really popular in the late 90s until 9/11. It has grown a lot recently since more and more parks have opened.NYC has the Banks and although they are closed we hope they reopen by 2015. I feel when it opens the scene will get back even stronger. Can you tell us something about the sport that might surprise people? That everyone who is into extreme sports is not crazy or a slacker. It’s all practice and how much time you dedicate to something. You must have lots of great stories from your years working with kids. Tell us about one that inspired you (maybe one that involves good sportsmanship, or a child that overcame some obstacle and succeeded). My Friend Vin Crispino fell grinding a rail in a park and hit his head really badly. The doctors told his family that he might not make it, and if he did he might never be able to ride again. It was a long process, but he made it through and now rides just as good as he rode before he fell. He is now a spokesman for helmet advocacy, and is sponsored by Triple 8 Helmets. I love the Banks and the old Ben Soto Skatepark (located in the Midland Beach section of Staten Island). Is 1984 considered a sports book? Best sports memory (involving you as a participant or a spectator)?